For Open-reel tape decks. Designed to hold reels on the spindles of decks that did not have built-in Reel locks. These will fit Akai, Ampex, Concertone, Crown, Dokorder, Panasonic, Pioneer QT-74 / QT-6100 / QT-6600 / T-600 / T-6000 / T-6100, T-6600, T-8800 (and others), Sansui, Sony*, Teac, Rheem, Roberts and other reel-reel tape decks that have standard reel spindles. Easy and quick to take on and off. Old, originals are invariable going to be 'slick' and / or have enlarged holes that will not grip the spindle safely / sufficiently anymore. We know as we have dozens of originals (a few of which are shown above), none of which work well enough to use / trust anymore. 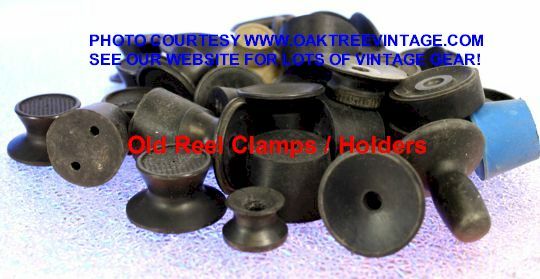 Our new / fresh ones are great to replace your old, dried out / cracked or lost ones. These are new rubber and will grip well. * Still best to use Sony decks in horizontal mode unless you have the original Sony Rubber clamps as they are slightly different w/ a 'wire' clip imbedded inside rubber. These stoppers will work with Sony's when used in horizontal position and if you're 'attentive' while operating the deck, in the 'vertical' position as well.